Where do I use my You Garden voucher code? 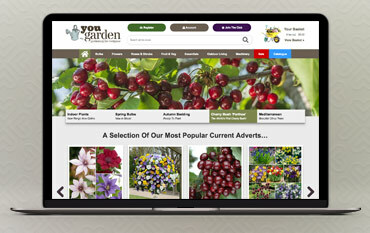 Shop online at You Garden and discover spring flowering bulbs, British native bulbs, lilies, summer flowering bulbs, baskets, bedding plants, perennials, indoor plants, instant impact plants, Mediterranean plants, roses, flowering shrubs, trees, foliage interest shrubs, hedging plants, standards and climbing plants. As well as this you can also find fruit trees, fruit bushes, strawberries, raspberries, blackberries, vegetables, herbs and garden essentials like compost, feeds, fertilisers, pots, planters, hanging baskets, garden equipment, lawn care, pest and disease control, bird feed and feeders. If you’re looking for outdoor living products you can find a huge selection at You Garden including furniture, decorative products, planters, raised beds and pet accessories. You can also find a massive range of machinery too like lawnmowers, strimmers, trimmers, pressure washers, trolleys, wheelbarrows, chainsaws, accessories and ride on mowers. If you’re not an experienced gardener you can also find loads of helpful information at You Garden too including jobs to do this month section, a plant care instructions section, a wide selection of videos and a plant finder. You Garden has a really handy catalogue that’s updated every season. Available to download online via the You Garden website, the seasonal garden catalogue is filled with information on all things gardening with tons of garden and plant products and exclusive offers and deals too. Discover award-winning gardening products, ‘as seen on TV’ plants and loads of affordable plants, bulbs, garden furniture and machinery with a ‘lowest price ever’ guarantee. If you’re shopping on a budget, or are looking to fill your garden with seasonal favourites for less then check out the sale section at You Garden. With up to 50% off a huge range of products like tulips, daffodils, fuschias, bamboo, climbing roses, clematis, cherry trees, superfruits, compost, bug repellant, garden urns and much more. All these planting products are discounted heavily because they’re either coming to be out of season, they’re damaged or they’re end of line. All they need is some TLC and work from your handy green fingers and they’re sure to be just as beautiful and pretty as the full priced items. And, as for the machinery, essentials and outdoor living items- they’re all bargain buys that’ll you’ll be stupid to miss out on. If you want your garden to look nice but aren’t interested in putting in hours of work then bulbs are a great option for you. Bulbs are simply the easiest things to grow in the garden, as once planted there is almost no effort needed. Many of the bulbs grown on You Garden’s farms have enough energy to burst into life season, after season, so year, after year you can enjoy fresh flowers and foliage from your affordable bulbs. In autumn, prepare for the following spring by planting tulips, daffodils, iris, crocus, or trendy alliums. From mid-December until May, plant lilies of all types, gladioli, and freesias, as well as native bluebells and snowdrops. As the soil warms from March, try exotic dahlias, gingers, cannas and tuberose for tropical summer displays, allowing you to have colourful, stunning flower displays all year round. You Garden supplies a huge range of bulbs, flowers, shrubs, fruit and veg, outdoor living products and gardening supplies on their website. Many of the produce and plants from You Garden come straight from their nursery in rural Lincolnshire, spanning across 11 acres of land, fully owned by the European Agricultural Fund for Rural Development. With this in mind you can buy from You Garden with complete confidence that your plants and garden accessories are locally sourced and ethically farmed, and if you buy with a You Garden discount code from us, you can ensure they’re incredibly affordable too.